There is no doubt about the importance of Roman advances in science, technology, and philosophy. On the other hand, some aspects of their lifestyle and habits remain controversial. The ancient Roman Empire was truly a force to be reckoned with. Through their monumental efforts, the Romans managed to conquer a huge territory and unify it with law, architecture, and art. Today, we still benefit from the knowledge they left us. But a closer view of the evidence about their day to day life reveals behavior that was far from glamorous. 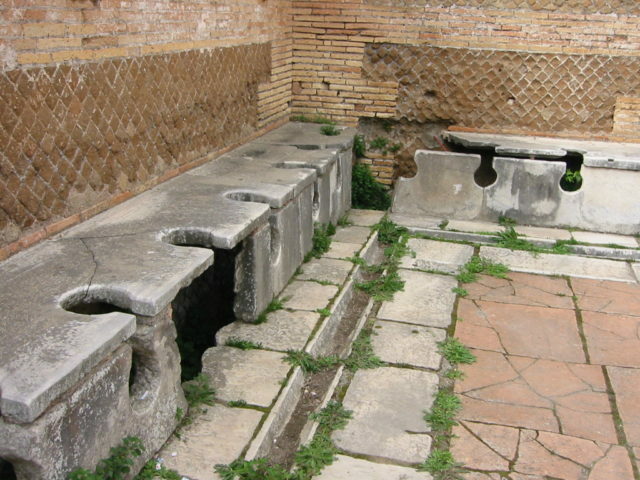 Ancient Roman latrines (latrinae) in Ostia Antica. It seems that Roman toilets were a terrifying and deadly place; people even used magic to get out of them alive. Public toilets in Ancient Rome were the exact opposite of their public baths. Whereas baths were relaxed and pleasant places, toilets could be foreboding. The Roman public “throne” was usually a dark hole connected to a sewer channel, opened to all sorts of creatures. Some of the public toilets had even 50 dark holes with no dividers between them. Danger lurked in every corner. Very often rats (or some other critters) would crawl up the hole and bite the posterior of the unlucky person. Another problem were methane buildups in the sewer. On some occasions, the gas would ignite and expose people to “naked flames.” It could be an “explosive” experience. This is why people all around the empire relied upon magic and superstition for toilet protection. Archaeologists found many magical spells meant to ward off demons etched into lavatory walls. Another thing that demons hated was laughter. People used to carve all sorts of caricatures that helped them laugh while doing their business inside. When the situation was particularly dire, people called on the gods for help. One such goddess was the Roman goddess of luck, Fortuna. An image of Fortuna guarded some of the toilets. It took a long time for the Romans to realize that they needed hygiene, not luck, to stay healthy and safe inside the toilets. We have already mentioned how dangerous and disgusting the ancient Roman toilets were, but it gets even worse. People back then didn’t have the luxury of toilet paper. Instead, they used all sorts of things for wiping. 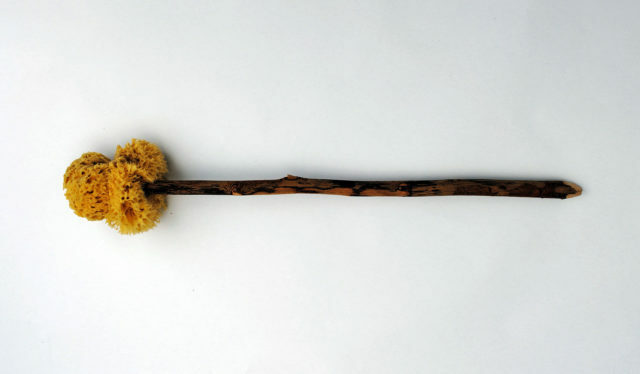 One of the most common tools was a sponge on a stick. This dirty tool was called “xylospongium” and usually, there were only a few of them per public toilet, resting in a basin of dirty water. The worst part is that they were shared and never cleaned after usage. This was probably the most efficient way to spread bacteria and diseases (such as typhoid and cholera) in the ancient days.